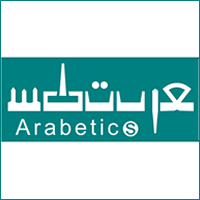 Operating as arabetics.com, Arabetics is New York based private foundry and consulting firm specializing in Arabic fonts and lettering design, and related Arabic typography software solutions. It is best known for producing innovative, and inspiring non-traditional simplified fonts. Arabetics prime mission is to produce quality fonts to support Arabetic scripts computing and typography needs. It was founded in 2003, by type designer Saad D. Abulhab who introduced earlier the US Utility Patent awarded Mutamathil Type Style, the underlying design template behind most of Arabetics fonts. The Mutamathil design philosophy aims at producing extended Arabic fonts that would diversify and enrich users typographic options and address the scripts challenges of literacy, education, economics, technology, global competition, as well as style and legibility. Mr. Abulhab is an IT Electrical Engineer and a librarian. His involvement in Arabic type design and computing goes back to 1992.